QJ (D / S) RF-type fine cutting of small pneumatic fluorine O type ball valve is a pneumatic piston actuator and fluorine O type ball valve components. Spool using fluorine cylindrical hole sphere and soft seal seat. The product is compressed air as power source, with the positioner (or solenoid valve) to achieve a continuous adjustment of the valve (or bit control). The product body wall and the metal valve components from the corrosion-resistant lining, anti-aging poly FEP (F46), which has good corrosion resistance, aging resistance, long life, small flow resistance, flow capacity advantages, especially for the industry to acid, alkali and other strong corrosive media applications. 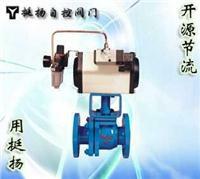 Adjustment type: electric - gas valve locator (or electrical converter), air filter regulator, hand wheel institutions. Cut-off: two five-way solenoid valve (spring return valve with two links), the valve switch (or close to the switch), air filter regulator, hand wheel institutions.